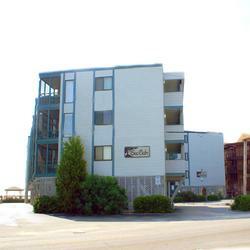 Oceanfront and ocean view units accommodating 6-8 people. Oceanside swimming pool. Each condo features central HVAC, all-electric kitchen, living-dining area, telephone, cable TV, washer/dryer, dishwasher, microwave and private balcony. Parking is limited to one space per unit. No trailer or boat parking. Pets are not allowed. Golf Carts are not permitted. 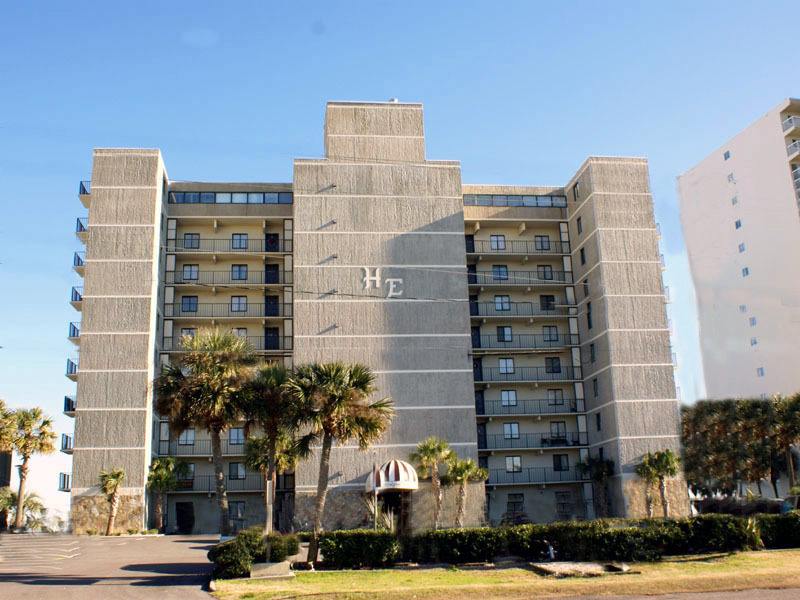 Atalaya Towers is a concrete and steel building with all oceanfront units that offers an enclosed heated pool and hot tub, outdoor pool, grilling area and elevators. Parking is limited to 2 vehicles. These 3-bedroom, 2-bath condos accommodate 8-10 people. Each condo features central HVAC, all-electric kitchen, living-dining area, telephone, cable TV, washer/dryer, dishwasher, microwave and private balcony. No pets are allowed. Golf Carts are not permitted. 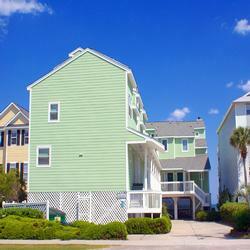 Beach House offers guests oceanfront and oceanview condos accommodating 6 with 2 bedrooms and 2 baths. Oceanside swimming pool and coin-operated laundry. Each condo features central HVAC, all-electric kitchen, living-dining area, telephone, cable TV, dishwasher, microwave and private balcony. Some condos have a washer-dryer. No pets are allowed. Golf Carts are not permitted. Beach Walk is a 2nd row complex offering a limited view of the ocean from most balconies and accommodating 6-7 with 2 bedrooms and 2 baths. Large swimming pool for guests to enjoy. All condos feature central HVAC, all-electric kitchen, living-dining area, telephone, cable TV, washer-dryer, dishwasher, microwave and private balcony. No pets are allowed. Golf Carts are not permitted. 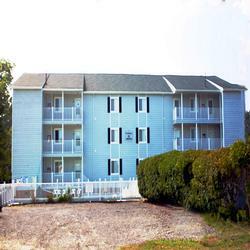 Cape Coddages II features all oceanfront condos (some are recessed) accommodating 6-10 with 2-3 bedrooms and 2-2.5 baths. Townhomes and flats. Oceanside pool and outside shower area. Some condos have a private Jacuzzi. All condos feature central HVAC, all-electric kitchen, living-dining area, telephone, cable TV, washer/dryer, dishwasher, microwave and private balcony. No pets are allowed. Golf Carts are not permitted. 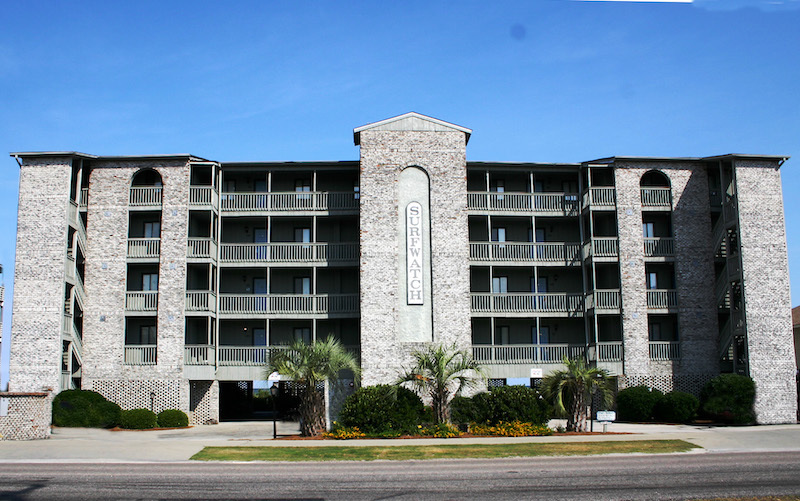 Carolina Shores Resort features oceanfront and oceanview condos accommodating 4-6 with 1-2 bedrooms and 1 bath. All condos have a bunk bed that is recessed at the wall near the kitchen. Oceanside swimming pool, elevator and coin-operated laundry on site. Each condo features central HVAC, all-electric kitchen, living-dining area, telephone, cable TV, dishwasher, microwave and private balcony. Parking is limited to 1 vehicle. No pets are allowed. Golf Carts are not permitted. 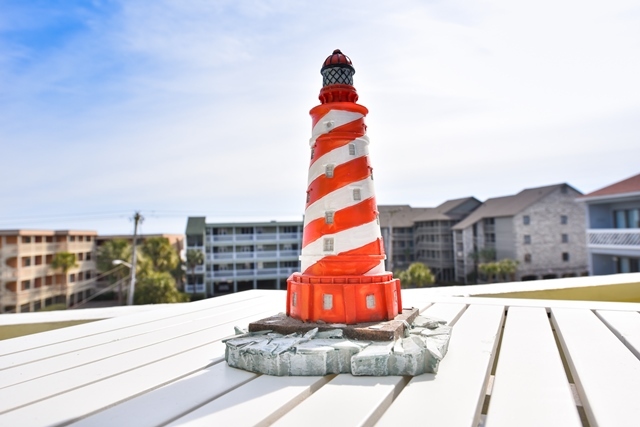 Channel Marker offers all oceanfront condos accommodating 4-7 with 1-2 bedrooms and 1-2 baths. Oceanside swimming pool. Picnic area with BBQ grill. Each condo features central HVAC, all-electric kitchen, living-dining area, telphone, cable TV, washer/dryer, dishwasher, microwave and private balcony. No pets are allowed. Golf Carts are not permitted. 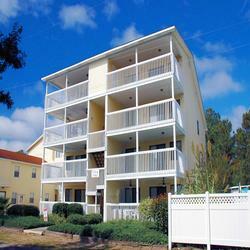 Colony III is a 3rd row complex just a short stroll to the ocean, accommodating 4-6 with 2 bedrooms and 2 baths. Each condo overlooks a lovely fresh water lake. Swimming pool and grill area. 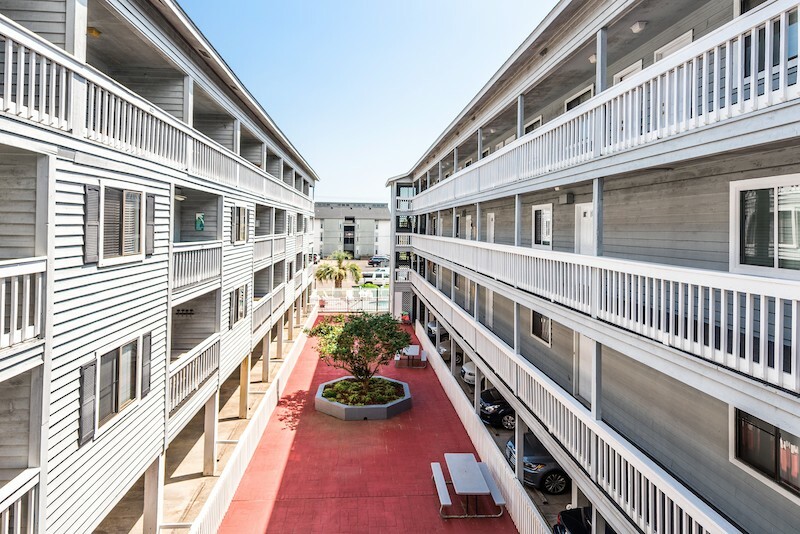 Each condo features central HVAC, all-electric kitchen, living-dining area, telephone, cable TV, washer/dryer, dishwasher, microwave and private screened porch. No pets are allowed. Golf Carts are not permitted. Colony Villas is located on the 3rd row, just a short walk to the ocean, accommodating 6 with 2-3 bedrooms and 2-3 baths. Each condo features central HVAC, all-electric kitchen, living-dining area, telephone, cable TV, washer/dryer, dishwasher, microwave and private balcony. No pets are allowed. Golf Carts are not permitted. 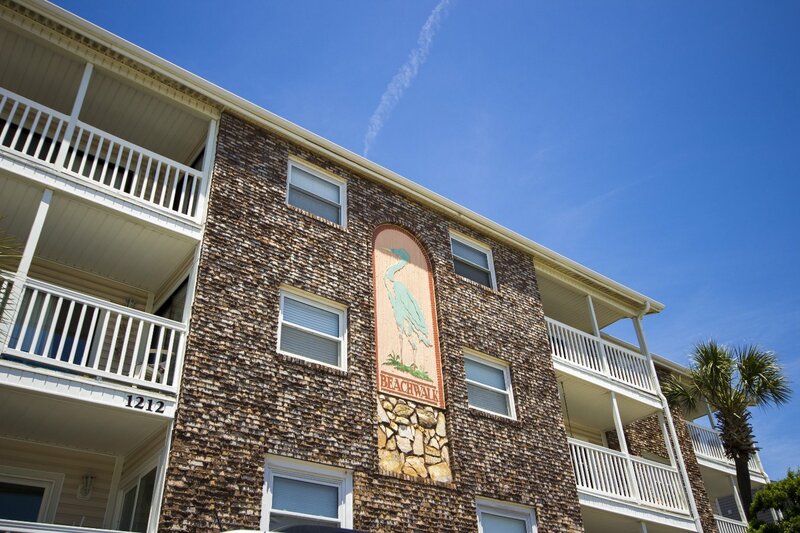 The Cricket is located on the 2nd row with easy access to the ocean, accommodating 4-6 with 1 bedroom and 1 bath. Each condo features central HVAC, all-electric kitchen, living-dining area, telephone, cable TV, washer/dryer, dishwasher, microwave and private balcony. Golf Carts are not permitted. Dolphin Cay features all oceanfront condos and an oceanside swimming pool, accommodating 6-8 with 2-3 bedrooms and 2 baths. Each condo features central HVAC, all-electric kitchen, living-dining area, telephone, cable TV, washer/dryer, dishwasher, microwave and private balcony. First floor units have access to pool area from porch. No pets are allowed. **No recreational vehicles, motorcycles or trailers allowed on the premises** Golf Carts are not permitted. Oceanfront Condo, 3 Bedrooms: Sleeps 8 , Fully Equipped Kitchen, Oceanview balcony, WIFI, Flatscreen TV in living area and Master bedroom. Floral Villas is located second row in North Surfside Beach and offers guests a large pool surrounded by beautifully landscaped grounds. 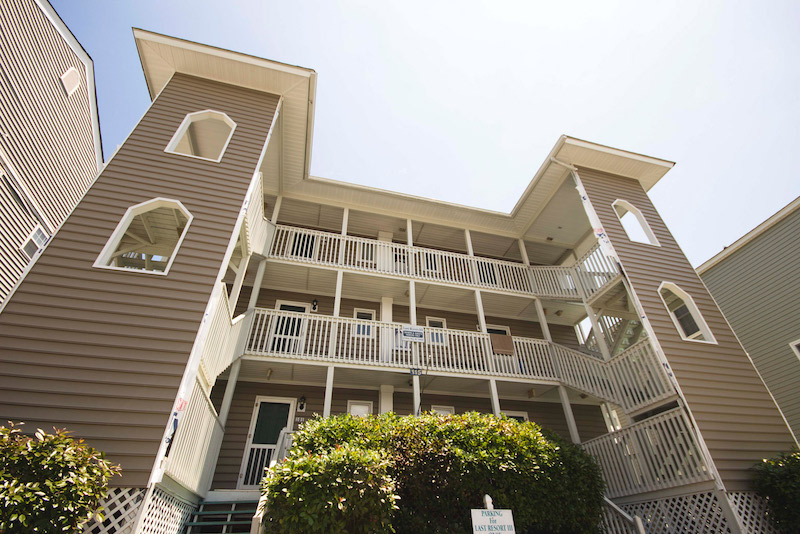 Each spacious condo has sun decks, private porches, wireless internet, and a fully equipped kitchen. All first floor units are ground level. No pets are allowed in any of the condos. 2 parking spaces per reservation. Golf Carts are not permitted. The Hermitage is located on the 3rd row and offers very spacious condos accommodating 6-8 with 2-3 bedrooms and 2 baths. Each condo has a private balcony overlooking Myrtle Lake. Lovely, landscaped grounds with covered gazebo. Just a short walk to beach access. Each condo features central HVAC, all-electric kitchen, living-dining area, telephone, cable TV, washer/dryer, dishwasher, microwave and private balcony. No pets are allowed. Golf Carts are not permitted. Welcome to Holiday House! This is a charming 4-plex located just across the street from a public beach access to the ocean. 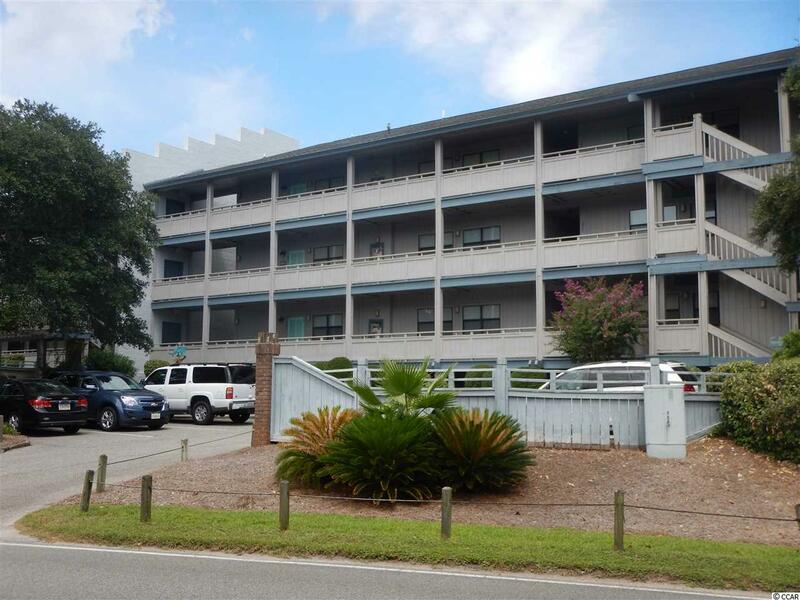 Each condo features a spacious deck to enjoy views of the ocean, along with a large interior. There is also lots of room under the 4-plex to enjoy grilling, playing ping-pong, eating at the picnic table, or swinging in the cool evening air. Golf Carts are not permitted. Horizon East offers all oceanfront condos and an oceanside pool. Each condo has a breathtaking view of the ocean from a private balcony. Other features include 2 elevators and a secure lobby area. Parking is limited to 1 space per condo. The Islander is a beautifully landscaped 2nd row complex with lovely views of the ocean. Large pool, picnic table and charcoal grill for your enjoyment. You will also find an elevator for your convenience. Each condo has a private balcony. Golf Carts not permitted. Last Resort III is located on the ocean side of Ocean Blvd. and offers efficiency condos with a limited view of the ocean from most balconies, accommodating 4. Each condo features central HVAC, all-electric kitchen, living-dining area, telephone, cable TV, dishwasher, microwave and private balcony. Some condos have a washer/dryer. No pets are allowed. Golf Carts are not permitted. Lighthouse II offers all oceanfront condos with private balconies. Charcoal grill on site for guests' use. Parking is limited to 2 assigned spaces. Golf Carts are not permitted. Marshside Inn is a 3rd Row, oceanview condo building. 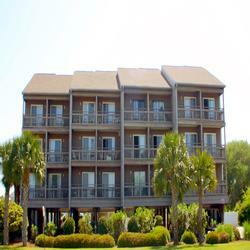 Each unit includes 2 bedrooms 1 bath, central air, dishwasher, screened porch overlooking the marsh pool & Jacuzzi. Covered parking. 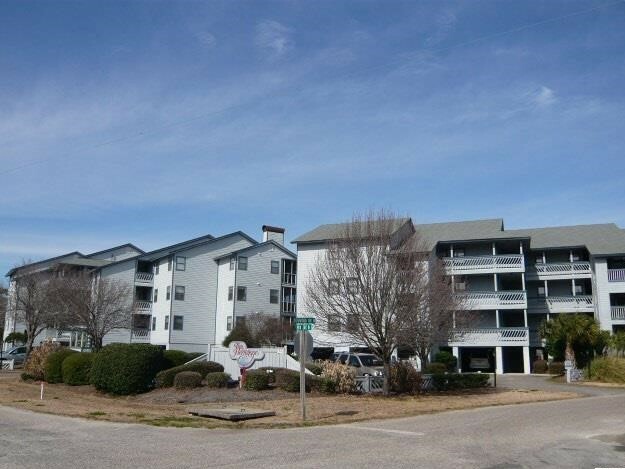 Centrally located on the inlet just one block back from the ocean and the Garden City Pier & Pavillion. Outside grills. NO PETS. NO TRAILERS. NO ELEVATOR. Golf Carts are not permitted. 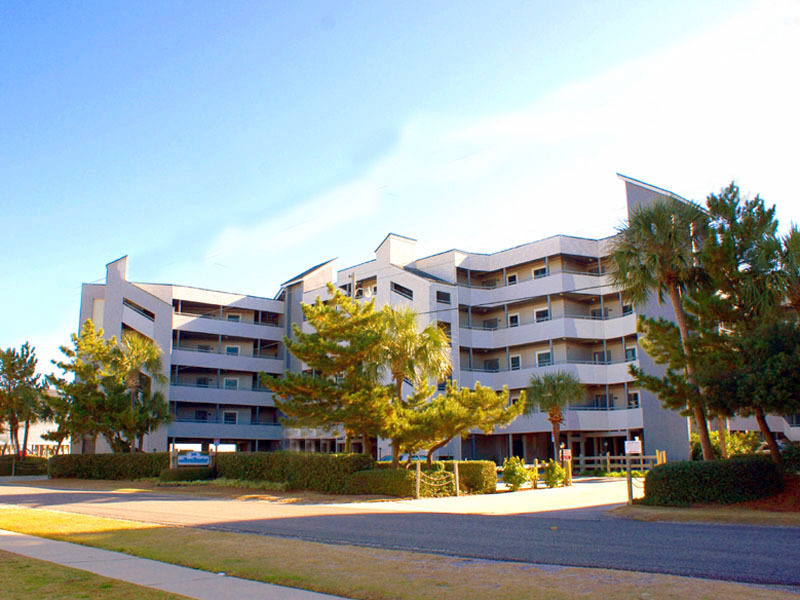 Ocean Cove condos offer both oceanfront and oceanview units. Each condo has a screened porch and a private balcony off the master bedroom. 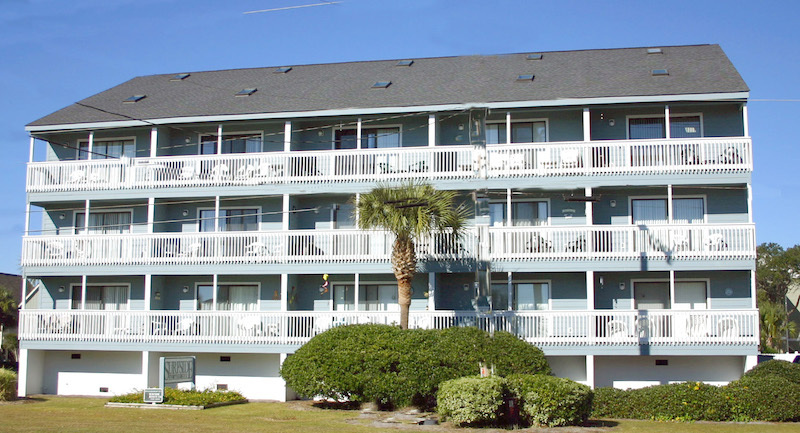 Ocean Cove has wireless internet, hot tub, elevator and oceanfront pool. Parking is limited to 2 spaces per reservation. Golf Carts are not permitted. Ocean Six features unique 3-bedroom oceanfront and oceanview condos. Three floors in each condo with a private sundeck. Oceanfront Jacuzzi operations only during the summer months. Golf Carts are not permitted. Pelican Pass is a 2nd row complex offering a large pool and beautifully landscaped grounds. Each condo has a private balcony that can be accessed from the living room and master bedroom. Trailer parking is not allowed. Golf Carts are not permitted. 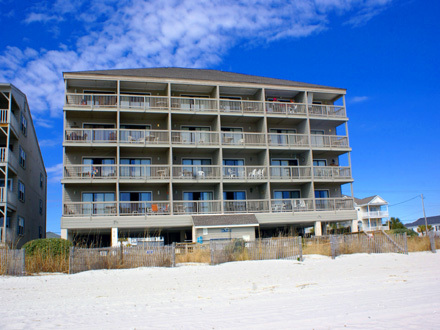 Princeton House I offers oceanfront condos accommodating between 6-7 people with 2 bedrooms and 2 baths. Each condo features central HVAC, all-electric kitchens, living-dining area, telephone, cable TV, washer/dryer, dishwasher, microwave and private balcony. No pets allowed on premises or in any of the condos. Parking is limited to 1 vehicle. Golf Carts are not permitted. 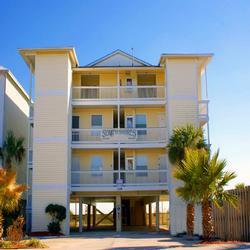 Princeton House II is an oceanfront complex with condos accommodating 6-7 with 2 bedrooms and 2 baths. 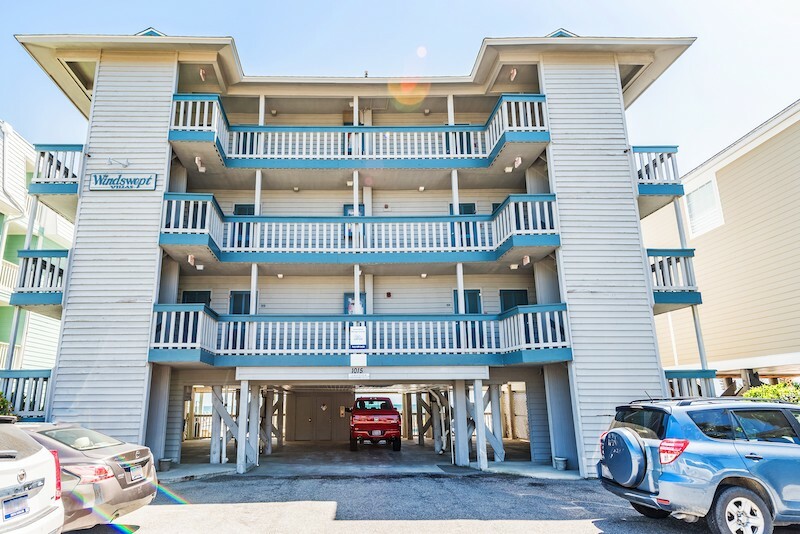 Each condo features central HVAC, all-electric kitchen, living-dining area, telephone, cable TV, washer/dryer, dishwasher, microwave and private oceanfront balcony. Parking is limited to ONE vehicle. No pets allowed. Golf Carts are not permitted. 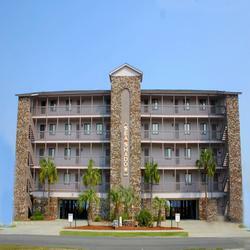 Royal Garden Resort provides all ocean front accommodations. 16 stories with 240 units. Each with a fully equipped kitchen and a living room with a private balcony. Condominiums are furnished with a dishwasher, color TV, phone, central air and wireless internet access. Special features include a heated indoor pool, outdoor pool (depth 3 - 5 feet), indoor and outdoor kiddie pools, outdoor grills, indoor hot tub, sauna and the convenience of a coin-operated laundry on the premises. An expansive tiered parking garage (clearance of 6'8") and three elevators are provided. No pets allowed in any of the units or on the premises. No recreational vehicles or golf carts allowed on the premises of any condominium complex. Golf Carts are not permitted. 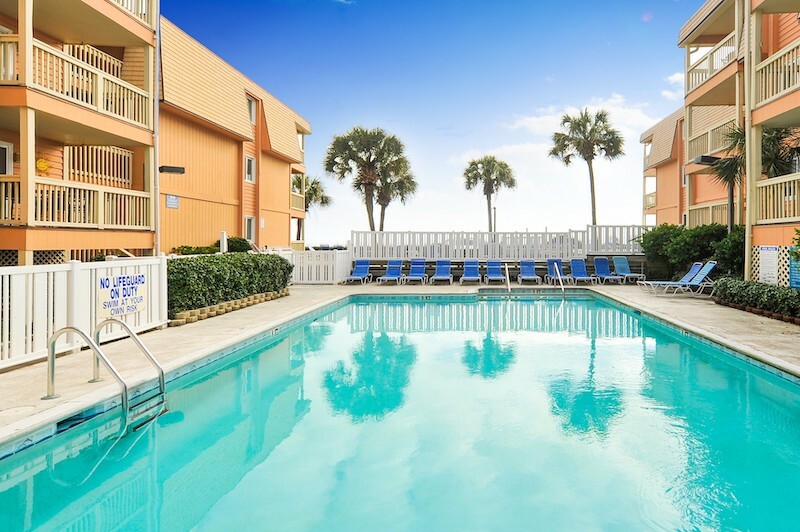 Sandfiddler is an oceanfront complex offering all oceanfront condos accommodating 6 with 1-2 bedrooms and 1 bath, oceanside swimming pool and shared laundry facilities. Each condo features central HVAC, all-electric kitchen, living-dining area, telephone, cable TV, dishwasher, microwave and private balcony. No pets are allowed. Golf Carts are not permitted. 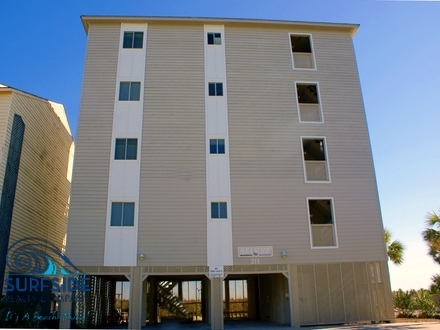 Sandy Shores II is a 2nd row complex with easy access to the ocean, swimming pool, elevator and accommodating 6-7 with 2 bedrooms and 1-2 baths. Each condo features central HVAC, all-electric kitchen, living-dining area, telephone, cable TV, washer/dryer, dishwasher, microwave and private balcony. No pets are allowed. Golf Carts are not permitted. Sandy Shores III is a 2nd row complex with swimming pool and easy access to the ocean, accommodating 6-7 with 2 bedrooms and 1-2 baths. Each condo features central HVAC, living-dining area, telephone, cable TV, washer/dryer, dishwasher, microwave and private balcony. Grill area located on premises. No pets are allowed. Golf Carts are not permitted. Sea Cloisters I is located on the oceanfront and offers oceanfront and oceanview units and an oceanside swimming pool, accommodating 6-10 with 2-4 bedrooms and 2 baths. Each condo features central HVAC, all-electric kitchen, living-dining room, telephone, cable TV, washer/dryer, dishwasher, microwave and private balcony. Some condos have a screened porch. No pets are allowed. A charcoal grill is located on property for guests use. Golf Carts are not permitted. 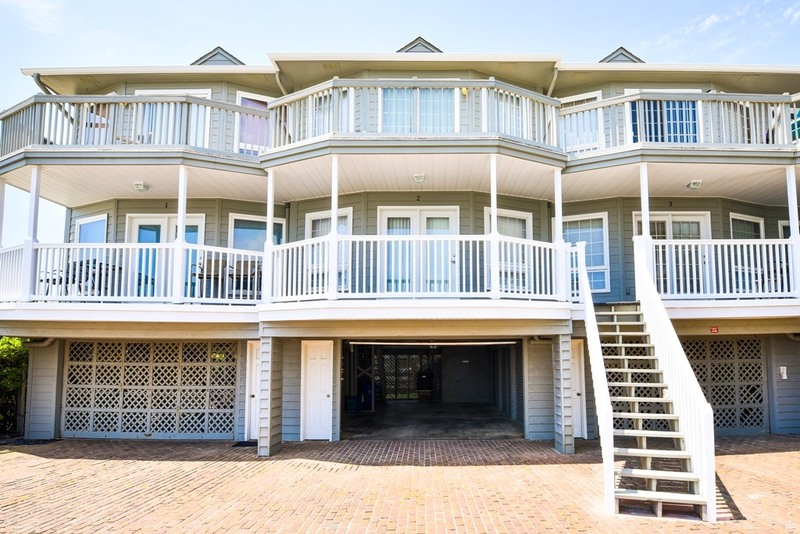 Sea Loft is a third row complex just a short walk to the ocean and beach access, accommodating 6 with 2 bedrooms and 2.5 baths. Each condo features central HVAC, all-electric kitchen, living-dining area, telephone, cable TV, washer/dryer, dishwasher, microwave, private balcony and patio. No pets are allowed. No Golf Carts are permitted. Sea Mystique is an oceanfront complex offering all oceanfront condos, an oceanside swimming pool, elevator and accommodating 6 with 2 bedrooms and 2 baths. Each condo features central HVAC, all-electric kitchen, living-dining area, telephone, cable TV, washer/dryer, dishwasher, microwave and private balcony. Parking is limited to one vehicle. No pets are allowed. No Golf Carts are permitted. 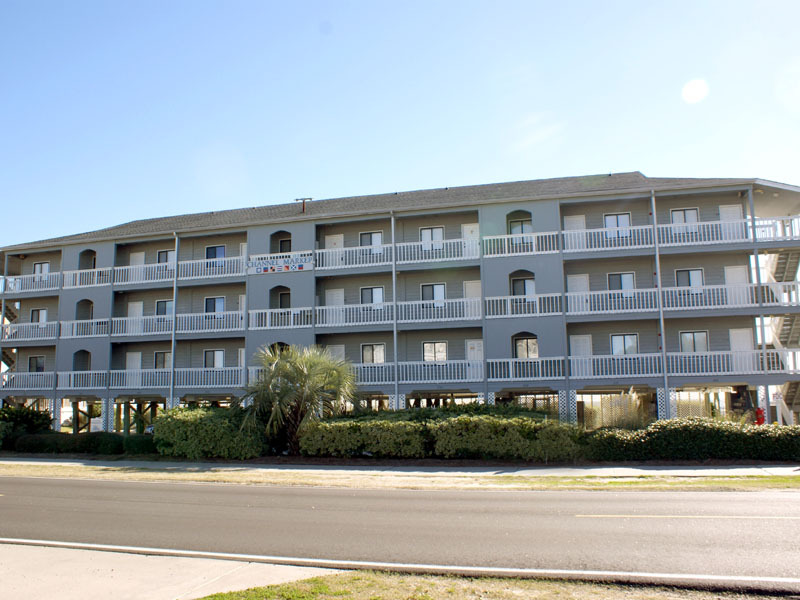 Sea Oaks is an oceanfront complex offering oceanfront and oceanview condos, an oceanside swimming pool and accommodating 6 with 2 bedrooms and 2 baths. Each condo features central HVAC, all-electric kitchen, living-dining area, telephone, wireless internet, cable TV, washer/dryer, dishwasher, microwave and private balcony. Parking is limited to one vehicle. Pets are not allowed. No Golf Carts are permitted. 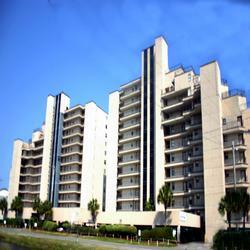 Seaside is an oceanfront complex in Surfside Beach walking distance to the Surfside Pier. 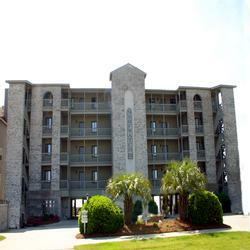 This complex offers magnificent oceanviews with steps right from your balcony down to the beach! No pets allowed in unit or on premises. No trailers or golf carts allowed at any condo complexes. No Golf Carts are permitted. 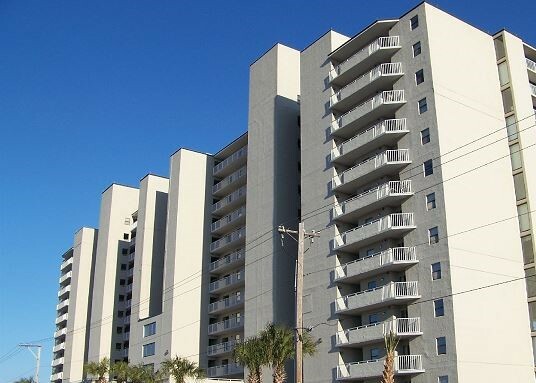 Shores of Surfside I is an oceanfront complex offering all oceanfront condos, grill area and an oceanside swimming pool, accommodating 6-8 with 2 bedrooms and 2 baths. Each condo features central HVAC, all-electric kitchen, living-dining area, telephone, cable TV, washer/dryer, dishwasher, microwave and private balcony. No pets are allowed. No Golf Carts are permitted. 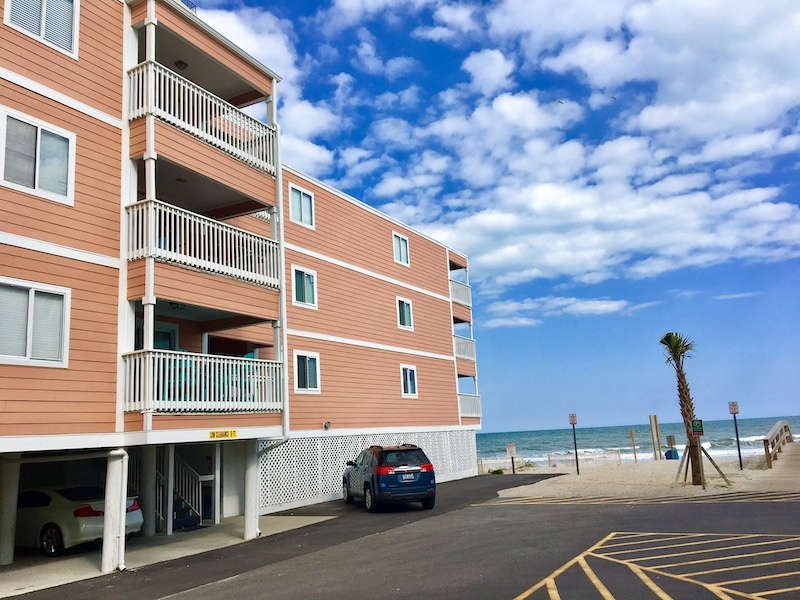 Shores of Surfside II is an oceanfront complex offering all oceanfront condos, grill area, oceanside swimming pool and accommodating 6-8 with 2 bedrooms and 2 baths. All condos feature central HVAC, all-electric kitchen, living-dining area, telephone, cable TV, washer/dryer, dishwasher, microwave and private balcony. No pets are allowed. No Golf Carts are permitted. South Shores I is an oceanfront complex offering all oceanfront units, an oceanside swimming pool and accommodating 8-10 with 2-3 bedrooms and 2 bathrooms. Each condo features central HVAC, all-electric kitchen, living-dining area, telephone, cable TV, washer/dryer, dishwasher, microwave and private balcony. No pets are allowed. No Golf Carts are permitted. South Shores II is an oceanfront complex offering all oceanfront condos, oceanside swimming pool and elevator, accommodating 5-9 with 1-3 bedrooms and 1-3 baths. Each condo features central HVAC, all-electric kitchen, living-dining area, telephone, cable TV, washer/dryer, dishwasher, microwave and private balcony. No pets are allowed. No Golf Carts are permitted. Oceanfront complex with four spacious condos with one condo per floor and direct beach access. 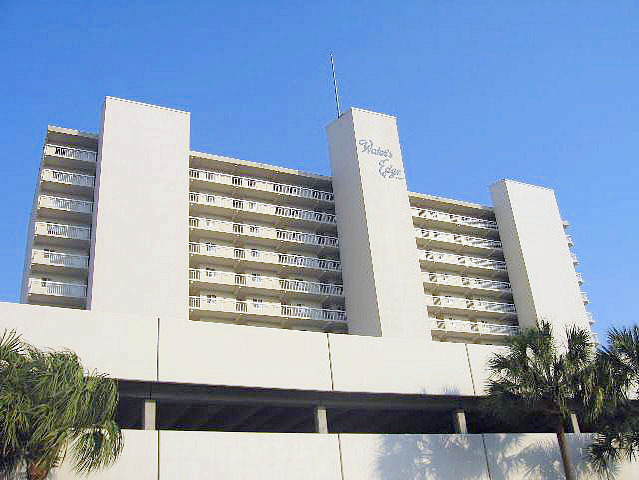 Elevator, outside shower, two parking spaces and walkway to the beach. Unit 3 has spectacular views from the large private balcony. Unit 3 accomodations 8 with 4 bedrooms. 1 queen, 1 Double, 2 Twins, 1 Double sofa bed. 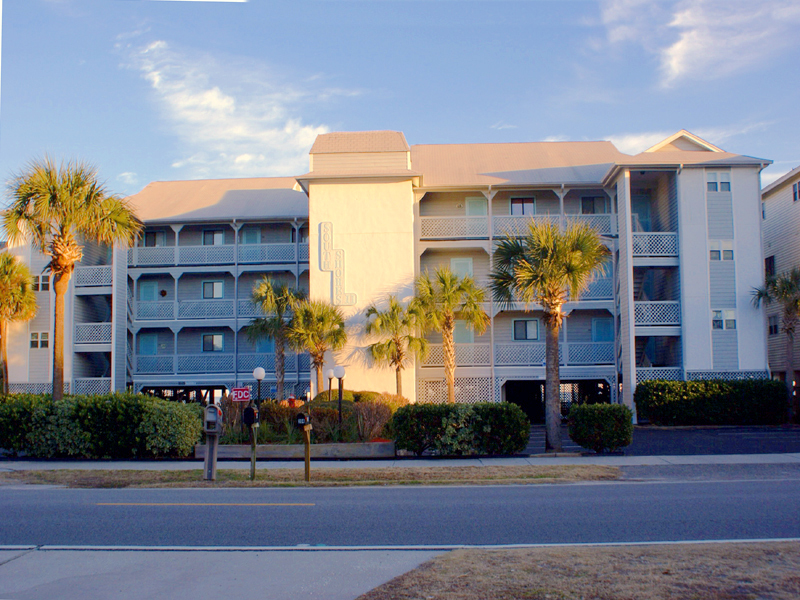 Surf Crest is an oceanfront complex located at 213 North Seaside Dr. Has a private walkway out to the beach. No Elevator. No swimming pool. No Pets allowed in unit or on premises. No trailers or golf carts allowed at any condo complexes. Surf Harbor is an oceanfront complex offering all oceanfront condos, an oceanside swimming pool and accommodating 8 with 3 bedrooms and 2 baths. Each condo features central HVAC, all-electric kitchen, living-dining area, telephone, cable TV, washer/dryer, dishwasher, microwave and private balcony. No pets are allowed. No Golf Carts are permitted. Surf Master is an oceanfront concrete and steel highrise offering all oceanfront condos, 2 swimming pools, oceanside hot tub and elevator, accommodating 4-8 with 1-3 bedrooms and 1.5 - 3 baths. Each condo features central HVAC, all-electric kitchen, living-dining area, telephone, cable TV, washer/dryer, dishwasher, microwave and private balcony. Parking is limited to one vehicle for one bedroom condos and two vehicles for two and three bedroom condos. Tiered parking garage with 7' clearance. No pets are allowed. No Golf Carts are permitted. Surf Walk is a 2nd row complex with easy access to the ocean, swimming pool and elevator, accommodating 8-10 with 2 bedrooms and 2 baths. Each condo features central HVAC, all-electric kitchen, living-dining area, telephone, cable TV, washer/dryer, dishwasher, microwave and private balcony. Coin operated laundry on site. No pets are allowed. No Golf Carts are permitted. Surfside by the Sea I is a 2nd row complex offering limited view of the ocean from most balconies, a swimming pool, accommodating 6 with 2 bedrooms and 1-2 baths. Each condo features central HVAC, all-electric kitchen, living-dining area, telephone, cable TV, washer/dryer, dishwasher, microwave and private balcony. No pets are allowed. No Golf Carts are permitted. Surfside By The Sea II is an oceanfront condo complex. These units are 3 bedroom and 2 bathrooms accomdating 8 people with private oceanfront balconies. It features a shared pool and all units have a private washer & dryer, WIFI, and 2 parking spaces. No pets and no smoking allowed. Surfwatch I is an oceanfront complex offering all oceanfront condos, oceanside swimming pool and elevator, accommodating 6-8 with 2 bedrooms and 2 baths. Each condo features central HVAC, all-electric kitchen, living-dining area, telephone, wireless internet, cable TV, washer/dryer, dishwasher, microwave and private balcony. No pets are allowed. No Golf Carts are permitted. Surfwatch II is an oceanfront complex offering all oceanfront condos, oceanside swimming pool, elevator, accommodating 6-8 with 2-3 bedrooms and 2 baths. Each condo features central HVAC, all-electric kitchen, living-dining area, telephone, wireless internet, cable TV, washer/dryer, dishwasher, microwave and private balcony. No pets are allowed. No Golf Carts are permitted. Surfwatch III is an oceanfront complex offering all oceanfront condos, oceanside swimming pool, elevator, accommodating 4-8 with 2-3 bedrooms and 2 baths. Each condo features central HVAC, all-electric kitchen, living-dining area, telephone, wireless internet, cable TV, washer/dryer, dishwasher, microwave and private balcony. No pets are allowed. No Golf Carts are permitted. Water's Edge is an oceanfront concrete and steel highrise offering all oceanfront condos, an oceanside swimming pool with swim-through, hot water spa, gazebo, heated indoor pool, elevators, accommodating 6-10 with 1-3 bedrooms and 2 baths. Each condo features central HVAC, all-electric kitchen, living-dining area, telephone, cable TV, washer/dryer, dishwasher, microwave and private balcony. Parking is limited to 2 vehicles for 3 bedrooms and 1 vehicle for 1 bedrooms and 2 bedrooms. Parking garage with 7' clearance. No pets are allowed. No Golf Carts are permitted. Whispering Sands is the perfect place to start your vacation! This complex is 2nd row, just a moments walk from the beach. Whispering Sands offers a shared pool for swimming. They do not allow pets or golf carts. 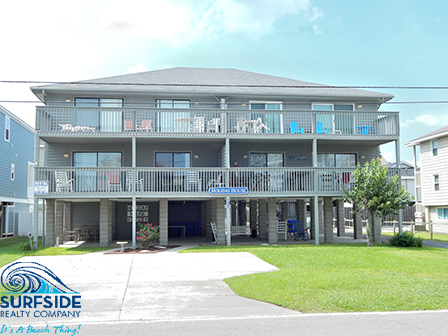 For your convenience, wireless internet access, cable television, a washer and dryer, are included in this perfect, cozy beach getaway. Windhaven is an oceanfront complex offering all oceanfront condos, oceanside swimming pool and elevator, accommodating 6-8 with 3 bedrooms and 2 baths. Each condo features central HVAC, all-electric kitchen, living-dining area, telephone, cable TV, washer/dryer, dishwasher, microwave and private balcony. No pets are allowed. No Golf Carts are permitted.